Our vision at Marrazzo's Market is to be recognized as a company that provides excellent service and food products. Our greatest asset and the key to our success is our people. Because satisfying our customers depends on the efforts of all of us, we are most effective when we work together as a team, respecting each other’s contribution and importance. We succeed when every thing we do is based satisfying you, our customer. We expect to achieve a fair and reasonable profit to ensure the prosperity of the company and to offer long-term benefits to our customers and our employees. Marrazzo’s Market has come a long way since 1947, when the family store was called Centre Fruit Market, just a small shop in downtown Trenton where Don Marrazzo tallied up purchases on pencil and paper. If you want to hear more about what it was like to run a mom-and-pop store back then, you can ask Don. Just head to the produce section at Marrazzo’s Market in Ewing on most days, and he’s there. Even though he gets around on an electric scooter these days, the 88-year-old elder Marrazzo still puts in four our five days a week at work along with his son Sam and granddaughter Mary. It’s that kind of hard work that has helped Marrazzo’s Market become a successful independently-owned supermarket in an arena dominated by large corporate chain stores. “I’m pretty pleased with the way things turned out,” Don Marrazzo said. The Centre Fruit Market on Centre Street in Trenton was Don Marrazzo’s first business endeavor after returning from WWII. He served in the U.S. as an Air Force mechanic. Mary, Don and his siblings ran the store. Later, their young son Sam helped out and learned the trade. In those days, Don and his wife Mary lived above the store when they weren’t working in it. Don used to drive to Philadelphia in the wee hours of the morning to buy fresh produce for the market. The brothers also went on to start local businesses, which is why the Marrazzo’s name is visible on a variety of stores in the Trenton area. Don said Sam enjoyed working in the store from a very young age. The Tastykake delivery man allowed a six-year-old Sam to pick out anything he wanted from the back of the truck when he made his deliveries. 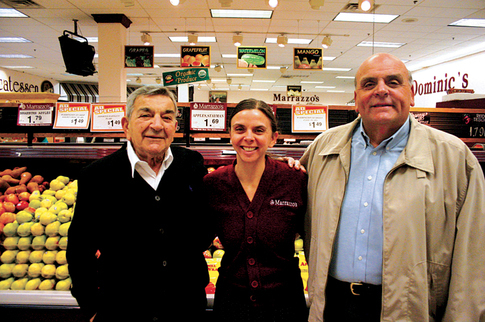 In 1961, The family opened their second location, Marrazzo’s Quality Market on South Broad Street in Trenton. Don later made Sam a partner in the business, and they continued to run that store until it came time to expand. Sam said they had bought the seven nearest buildings with the idea of building a large supermarket in downtown Trenton. But it soon became apparent that parking would be an insurmountable hurdle to that plan. In 1989, they opened Marrazzo’s Thriftway in Robbinsville, which they sold about three years ago.The Ewing location was opened in 2000. The Marrazzos own not only the supermarket, but the surrounding Serenity Plaza shopping center. The 36,000-square-foot supermarket is, by today’s standards, pretty small. Six Marrazzo’s Markets would fit inside of a typical Super Wal-Mart. There are also no self-checkout machines, like most modern supermarkets have. “You lose contact with the customer,” Mary Marrazzo said, explaining why her store lacks self-checkout machines. The small size can be an advantage. There is a neighborhood feel in Marrazzo’s that’s hard to replicate within a large corporation. An interview with a reporter was interrupted several times by customers greeting Mary and Sam and talking with them. Today, Sam is semi-retired. To him, that means working seven days a week at Marrazzo's. Mary runs the store, having decided to enter the family business after majoring in food marketing at St. Joseph’s college in Philadelphia. She said the store has stayed ahead of the competition, even as gas stations and pharmacies and other businesses have begun to sell food, by having better perishables and reasonable prices. Marrazzo’s Market is located at 1400 Parkway Ave. in Ewing and is open from 7 a.m. to 9 p.m. Monday through Saturday and 7 a.m. to 8 p.m. Sundays. For more information, call (609) 434-0020.